W is for World of Greyhawk. The WG or World of Greyhawk adventures take place, naturally, in the World of Greyhawk. This was the default setting of most of the 1st Edition AD&D adventures, and explicitly so for T, A, G, D and Q. The first named adventure was WG4 The Forgotten Temple of Tharizdun, which I covered briefly on "S" day. But wait, if it is the first why is it numbered "WG4"? Well according to the ole' Wikipedia "WG1 was earmarked for The Village of Hommlet (T1), and WG2 was earmarked for The Temple of Elemental Evil (T1-4). WG3 was to be Lost Caverns of Tsojcanth (S4), a loosely tied prequel to WG4." So they do make a series of sorts. WG5 Mordenkainen's Fantastic Adventure is an interesting one and might just be one of the last adventures Gary wrote for AD&D1 and TSR. It is a high-level dungeon crawl featuring a unique demon and lots and lots of hack n' slash action. It does feel like one of the older modules (though it was out in 1984 so it is "old" as well). I could fit in with the TAGDQ series somewhere I am sure. It could even be another one of the alternate worlds in Q1. I don't know much about WG6 Isle of the Ape, save that is was one of the first adventures for characters above 18th level. I do know about WG7 Castle Greyhawk. WG7 was supposed to be another Gygax penned adventure, but it didn't happen like that. Instead, we got a "joke" module. The idea was sound, the levels get harder and harder with all sorts of strange monsters. But is was played a huge joke. At the time (when I was 15) I thought it was funny, but even running it I knew it was bad. 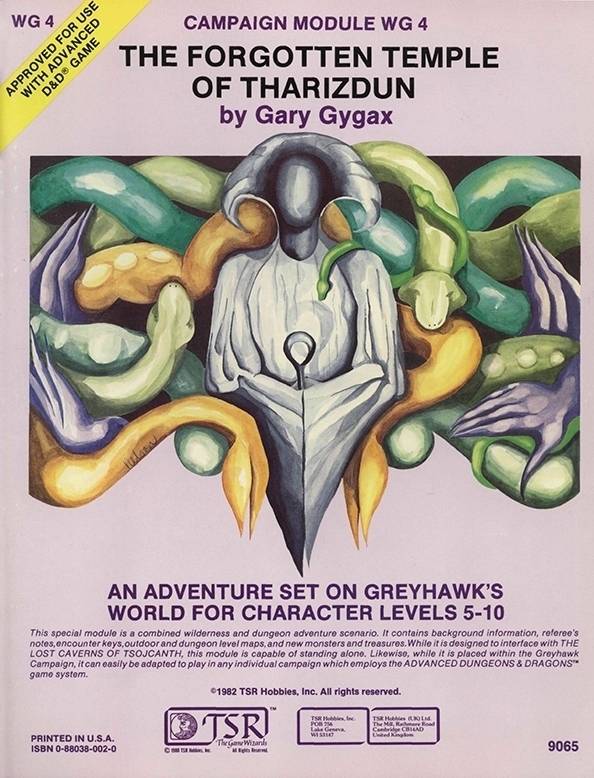 In the history of D&D Castle Greyhawk was a significant part of Gary's original game. For years we were teased with Castle Greyhawk but never got one. Even today we don't have the real thing. This makes WG7 all that much worse really. It's too bad really. The authors of WG7 do read like a who's-who of mid 80s game designers. Of the others, only WG12 Vale of the Mage interests me these days. I think it is because I was looking for more information of Greyhawk and the Vale of the Mage (home of the Valley Elves. No, I am serious) was one of those places I wanted more detail on. I seem to remember that before his death Gary was noodling around with releasing the real Castle Greyhawk under a different name through Troll Lord Games, but I never saw what became of it. He did and was working on them. Then the entire deal was killed by other parties. I won't name names, but they are the same party that killed Gygax magazine and trademarked "Gygaxian". I used to own Isle of the Ape, which I bought mostly to see what a high-level (mid to high teens?) adventure looked like. IIRC, it was a lost world type setting, a bit like Isle of Dread but for higher levels. And there was an extraplanar battle at or near the end that seemed rather jarring after the rest of it. I also owned WG4, which was IMO the much better module. (Or at least I remember more of the plot, which strongly implies it.) This was my first introduction to Tharizdun, as I didn't read ToEE until college, when my roommate had a copy. Isle of the Ape begins with Gygax saying something like: "This is an adventure of attrition." Vale of the Mage is worth getting if you want to complete your Greyhawk collection, but like with much of the early AD&D 2nd Edition Greyhawk stuff, its content is only so-so. It's part adventure, mostly gazetteer. I've never played any of the Greyhawk adventures. I'm familiar with the setting, but we never really used it. Our stuff was always homebrew or Forgotten Realms. I'm confused again - but that happens a lot, so don't worry :) I feel sad they never made the module you wanted. Actually never liked WG4. It felt like they were trying to cram in as many fiend folio monsters as possible so people would buy the fiend folio.